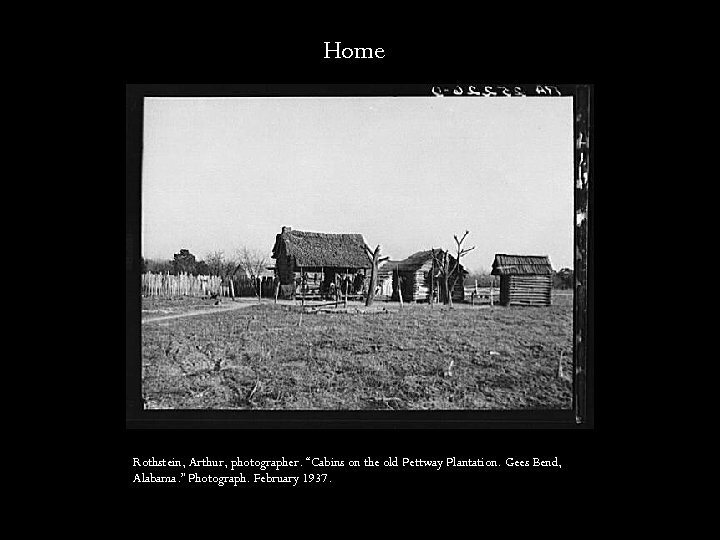 Home Rothstein, Arthur, photographer. “Cabins on the old Pettway Plantation. Gees Bend, Alabama. ” Photograph. February 1937. Home Wolcott, Marion Post, photographer. “‘Old man Mosely, ’ now blind, just sits by the house, Gees Bend, Alabama. ” Photograph. May 1939. 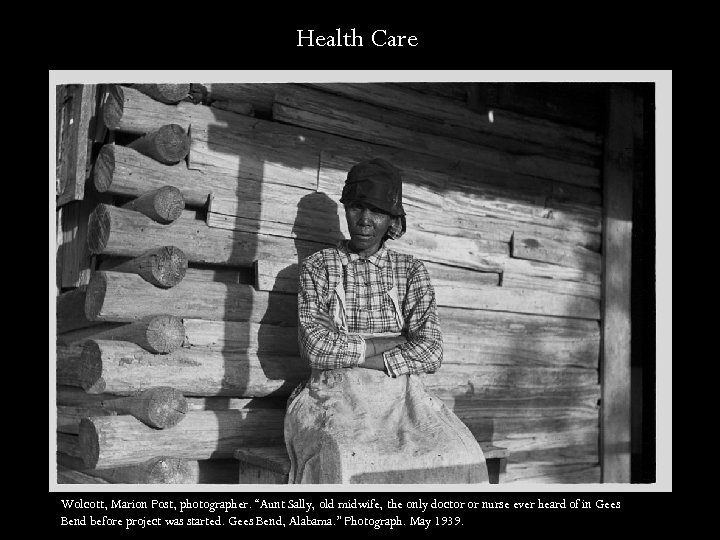 Health Care Wolcott, Marion Post, photographer. “Aunt Sally, old midwife, the only doctor or nurse ever heard of in Gees Bend before project was started. Gees Bend, Alabama. ” Photograph. May 1939. Rothstein, Arthur, photographer. “Conducting school in the church. Gees Bend, Alabama. ” Photograph. April 1937. School at Gee’s Bend Rothstein, Arthur, photographer. “Conducting school in a church at Gees Bend, Alabama. Photograph. April 1937. 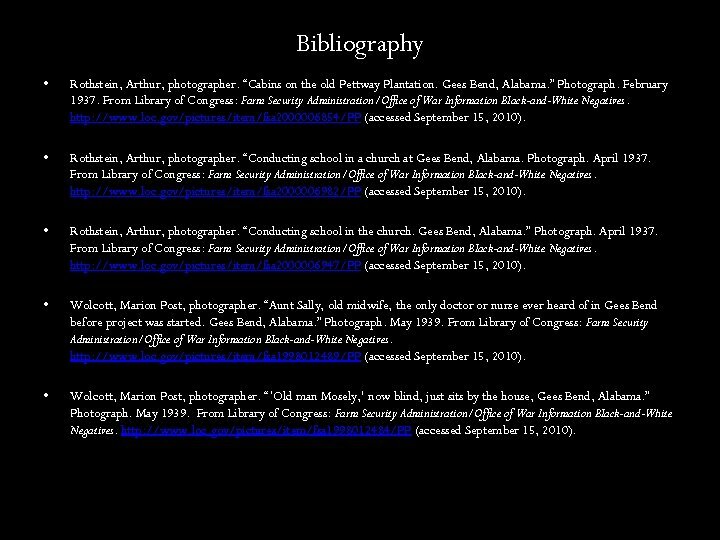 Bibliography • Rothstein, Arthur, photographer. “Cabins on the old Pettway Plantation. Gees Bend, Alabama. ” Photograph. February 1937. From Library of Congress: Farm Security Administration/Office of War Information Black-and-White Negatives. http: //www. loc. gov/pictures/item/fsa 2000006854/PP (accessed September 15, 2010). • Rothstein, Arthur, photographer. 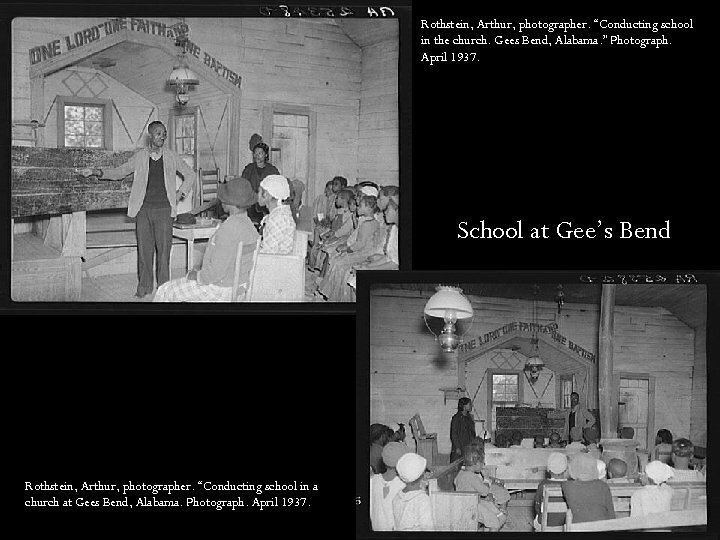 “Conducting school in a church at Gees Bend, Alabama. Photograph. April 1937. 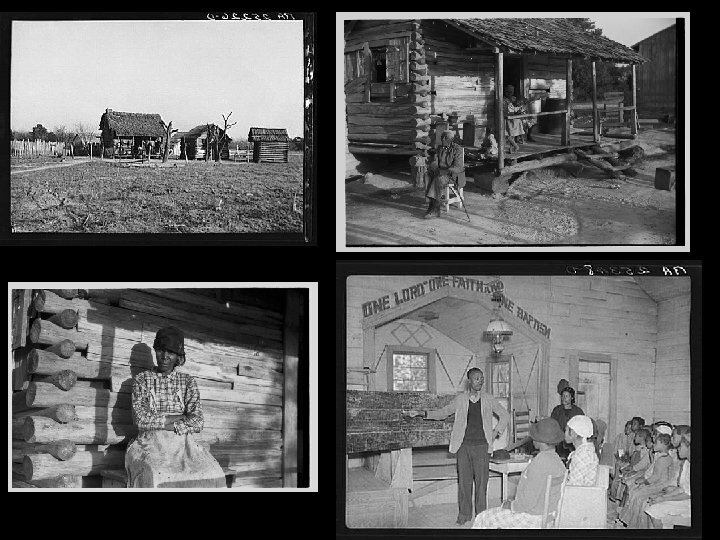 From Library of Congress: Farm Security Administration/Office of War Information Black-and-White Negatives. http: //www. loc. gov/pictures/item/fsa 2000006982/PP (accessed September 15, 2010). • Rothstein, Arthur, photographer. “Conducting school in the church. Gees Bend, Alabama. ” Photograph. April 1937. From Library of Congress: Farm Security Administration/Office of War Information Black-and-White Negatives. http: //www. loc. gov/pictures/item/fsa 2000006947/PP (accessed September 15, 2010). • Wolcott, Marion Post, photographer. “Aunt Sally, old midwife, the only doctor or nurse ever heard of in Gees Bend before project was started. 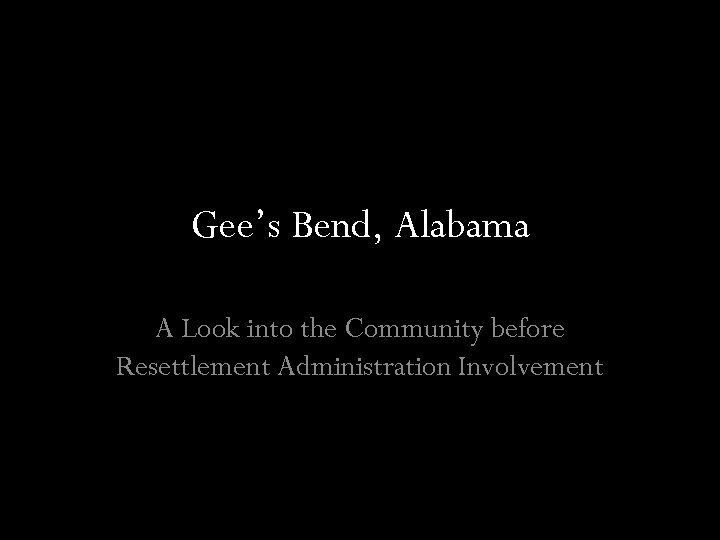 Gees Bend, Alabama. ” Photograph. May 1939. From Library of Congress: Farm Security Administration/Office of War Information Black-and-White Negatives. http: //www. loc. gov/pictures/item/fsa 1998012489/PP (accessed September 15, 2010). • Wolcott, Marion Post, photographer. 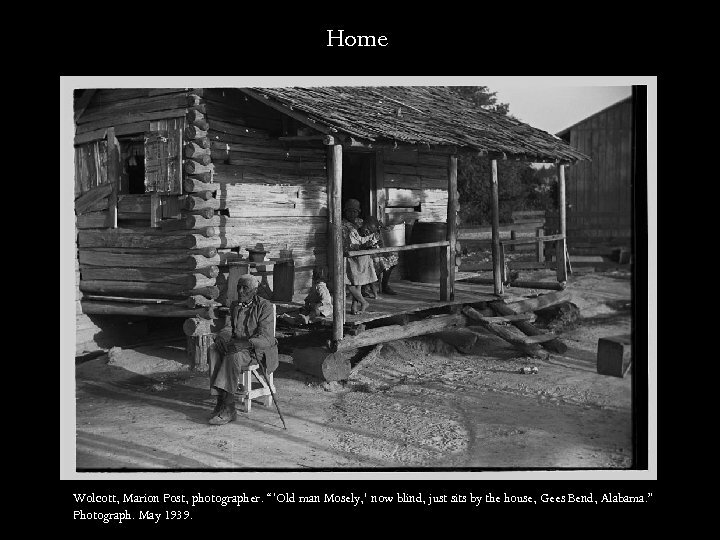 “‘Old man Mosely, ’ now blind, just sits by the house, Gees Bend, Alabama. ” Photograph. May 1939. From Library of Congress: Farm Security Administration/Office of War Information Black-and-White Negatives. http: //www. loc. gov/pictures/item/fsa 1998012484/PP (accessed September 15, 2010).